Come on people. Can we please start using social media for good instead of for judging, hateful, angry ranting? Now’s a great time as we look at the crisis happening down in Florida. Over the weekend, social media was abuzz about the choice of Halloween decorations made by a Homewood family. A charred-body was hung in their front yard and you would have thought they had actually lynched someone. Images were shared with *Trigger warning* messages. Seriously, people trigger warnings for Halloween decorations? Are there actually people in the world so sensitive that that’s necessary? 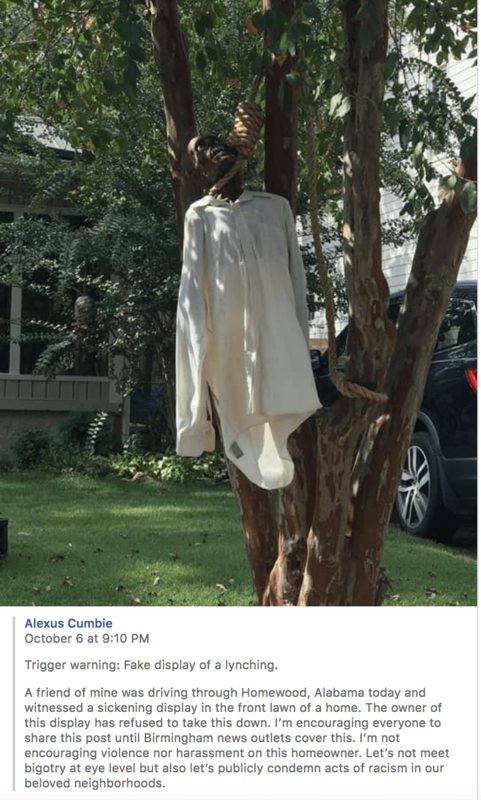 The family was gracious in their response noting they didn’t realize that they were inadvertently showing what appeared to some to be a lynching. They saw the doll as a white figure burned to a charred state (which is what I see). I feel terrible for them. This wasn’t enough for the angry mob of outraged and inflamed who continued to share the images and criticize complete strangers assigning all sorts of negative assumptions to them. To these people all I have to say is: You’ve got a lot of time, energy and passion. How about you use it for good instead of spreading hate and division? How about you stop and consider that most people are inherently good and that even if they weren’t, your energy spent on Facebook having fits wouldn’t change their mind. Thankfully we live in a city where philanthropy and volunteerism opportunities abound. If you’re unsure what to do with your free time and your interest in a better community how about you look for ways you can actually help because your social media outrage isn’t cutting it. I feel bad for those actually facing oppression and discrimination that their cause is done no favors by those who cry wolf and call something as innocent as a simple Halloween decorating mistake a travesty against humanity. So to bottom line it: Get a grip people. Use your energy for good. Show a little grace and stop with the outrageous use of outrage at every single human error as if you have never made a mistake.